Here is the winner (joanna) being picked out of my latest charity shop find- my new (old) cordouroy trilby!! 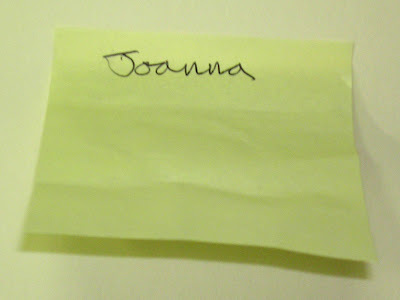 Joanna, please let us know your postal address, so we can send you the present. If anyone is interested in either of these 2 gorgeous necklaces email quick! 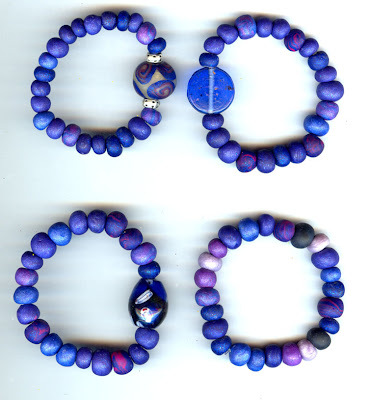 They will soon be on the way to 'Attrills' retail outlet. 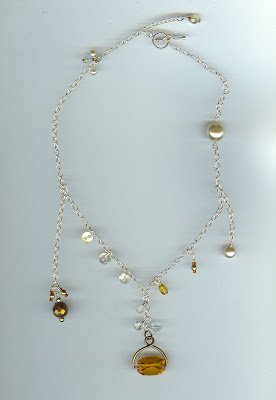 Both are asymetrical, and created using solid sterling silver with vintage beads and buttons. 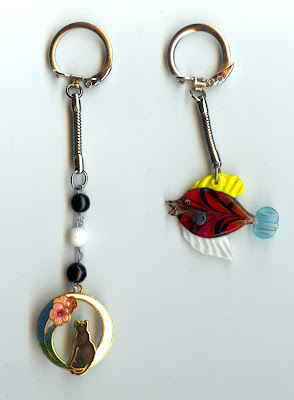 A cute little black cat and floral charm with beads, and also a glass fish. Please click on images to enlarge and view in greater detail. 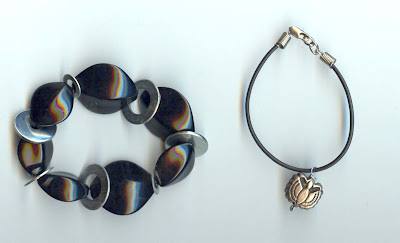 Firstly 2 bracelets, one with retro black plastic beads and metal washers on stretchy beading elastic, the other a metal charm on black bracelet with clasp. 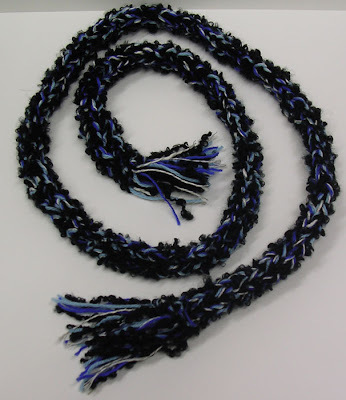 The second picture shows a close up of part of a very long thick black leather thong which can be tied around the neck at required length, featuring metal beads, washers and a large wooden bead covered in navy crochet. 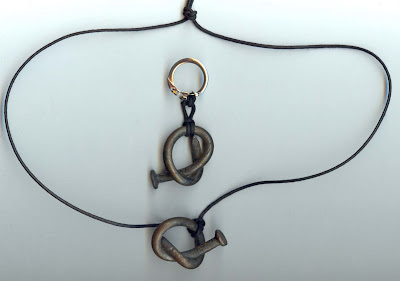 Thirdly, 'knotted nails' - one necklace on a thin, black leather thong, the other a key ring. 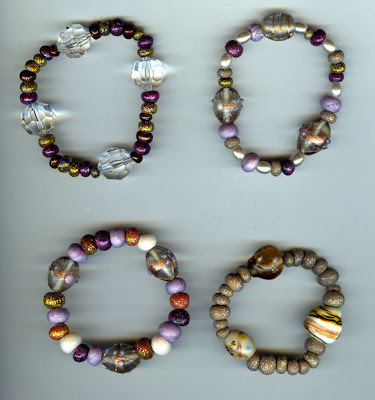 Here are a selection of newly made bracelets for sale. 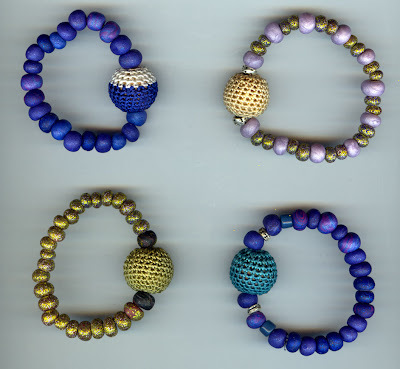 They all incorporate Toby's handrolled and baked polymer clay beads interspersed with large crocheted beads, lampwork, metal, plastic and glass, strung on beading elastic. Prices start from £5 plus p+p depending on size and design. to tell you 8 random things about ourselves. Toby set about taking some photo's around our home, and touched them up in Photoshop, then I uploaded them here to our blog and wrote about each one. I hope you all enjoy finding out a little more about us! Now, we have to tag 8 other people. This is not compulsory, and if we have chosen you, and you dont fancy joining in, that's not a problem. But please everyone, do leave us comments, that's why we blog, we love to hear from you all!! 1. Let others know who tagged you. 2. Players start with 8 random facts about themselves. 3. Those who are tagged should post these rules and their 8 random facts. 4. Players should tag 8 other people and notify them they have been tagged. This is a scale model of our house, made by my very clever husband (and Toby's Dad), Laurence. When we first moved here, many years ago now, Laurence decided he was going to take the roof off our home (as you do!) and replace it, by himself, along with buiding a new chimney. (Laurence had never done any roofing before this, and, as you can see, our house is round fronted, so the roof is curved, therefore each slate had to be hand cut to individual size and shape). The reason for making this model, is because Laurence decided that he wanted to make the guttering himself, which he did, by hand making a mould in wood and then casting the guttering in fibre glass and resin. 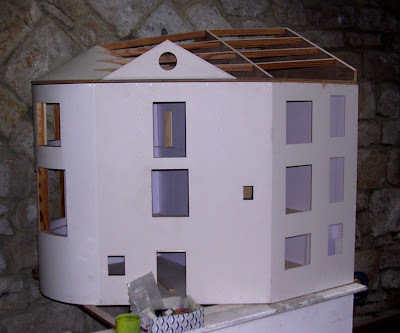 Before making the mould, he made the model of the house, so he could work out the angles and curves on the front of the building and then scale them up to life size! I think the model in itself is a wonderful object, it is about 3 feet tall. 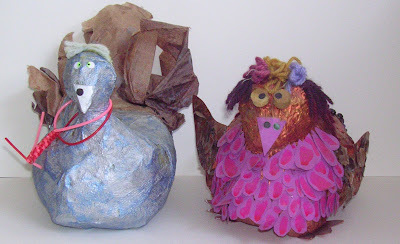 These are 2 money box birds, a pigeon and a chicken, both made by Toby a couple of years ago. They are made from pint plastic milk bottles, covered with paper mache, and then painted and decorated. They have a slit cut in their backs where you insert the coins, and the screw on plastic bottle tops are on their bottoms, under their tail feathers, so you can retrieve the money when needed. They live on top of our piano, and we collect £1 coins in them, to save up for various things, previously a holiday, and now a shower room, (which Laurence is in the process of building at the moment). Above the cooker in our kitchen, Laurence has put cheap, plain, white tiles, and he has cut them, to make a perfect circle (so clever!) and inlaid glass globules, which I love! 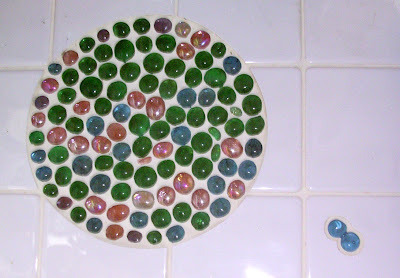 There is another, second, smaller circle, similar to this, and also a few small random pieces dotted around, you can see 2 blue ones in this photograph. In the last couple of weeks Toby has taken over the kitchen window sill with his mint plants, well mostly mint, there is also one strawberry plant, and one chilli. 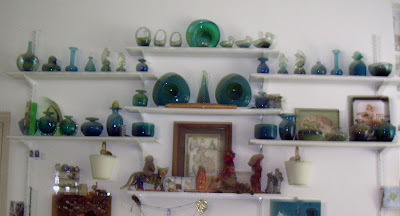 This is a shelf in Toby's bedroom where he displays some of his treasures, he tours the charity shops and flea markets looking for old china, he especially likes Hornsea and Nymolle. 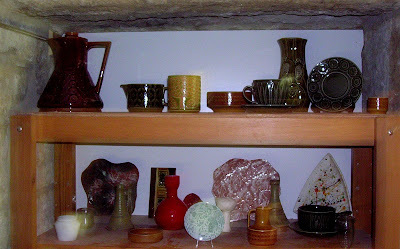 You can also see a triangular china plate which I painted with 'splats' for him, some of the ceramics he has made himself, and a little white pot he found in the canal. This is a photo of the shelving unit in my studio, next to my drawing board (you can see the desk lamp leaning over the drawing board). I work here everyday, as a self employed commercial artist. My work thesedays is quite varied, from designing toys, to gift bags, books, packaging, basically anything that pays me enough to make a living. When I first started out, and untill the last couple of years, the bulk of my commissions were to illustrate ranges of greeting cards. 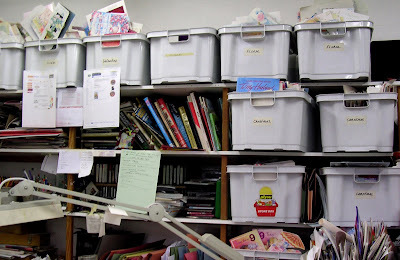 Here, in this photograph, you can see, in the pale grey boxes, greeting cards that I have collected over the years for reference, all sorted into catagories, for example, boxes full of male (cards suitable for a man), female, wedding, valentine, baby, christmas, etc etc. Toby has a small desk next to mine in the studio, where he makes his jewellery. We 'Jackson Pollocked' Toby's wardrobe. 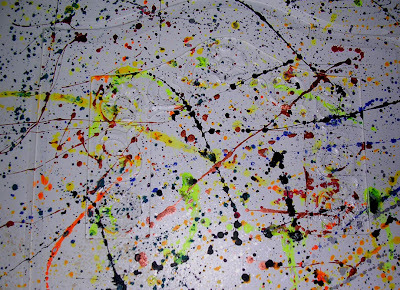 It started off as a second hand, dark wood, small wardrobe, Laurence and Toby painted it white, then Toby and I threw splats of acrylic paint all over it, this shows a close up of the splats! Well, thats the 8th and last random thing about us, I'm looking forward to visiting the blogs of the people that we tag, when Toby and I get back from Hastings at the end of next week. 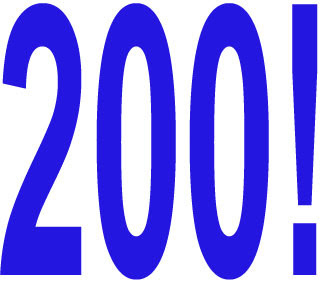 As this is our 200th post, we thought we'd have another give-away. 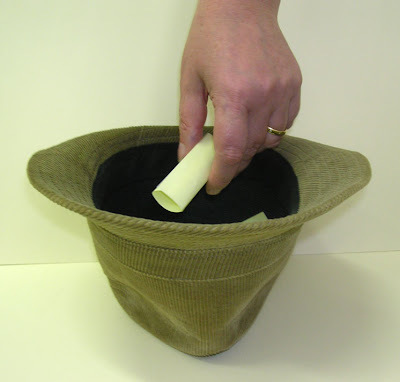 The rules are the same as last time: whoever comments before the end of the month, on this post, gets their name put in a draw, and the winner receives a surprise gift! 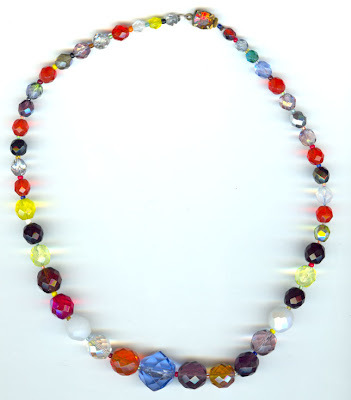 Tutti Fruitti is a fabulously fun, retro style necklace of glorious Czech Firepolish glass beads with tiny multi coloured seed beads inbetween each one. 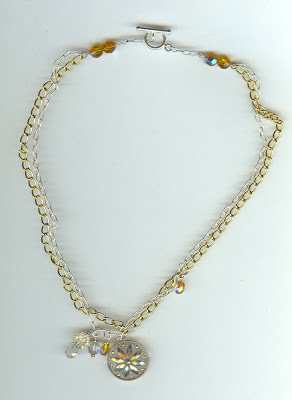 It features a large blue antique cut crystal in the centre and a vintage clasp at the back. 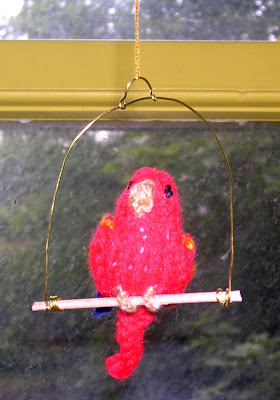 May i introduce Mr Maccy M. McCaw. who now resides in my bedroom. 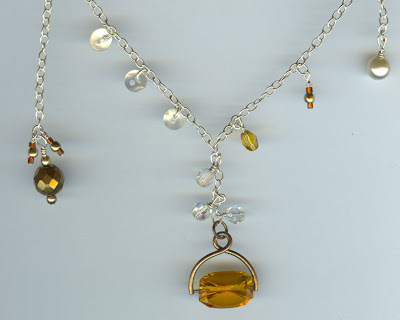 This is a vintage jet necklace which i have recently repaired for a friend's sister. 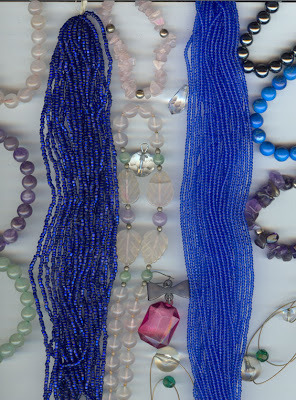 Each bead is individually knotted on so, it took almost 2 hours!! 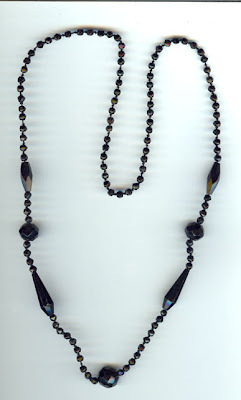 First i photocopied the original necklace, so i could remember the layout, then i cut each bead off the necklace, and re~knotted them onto new cord. 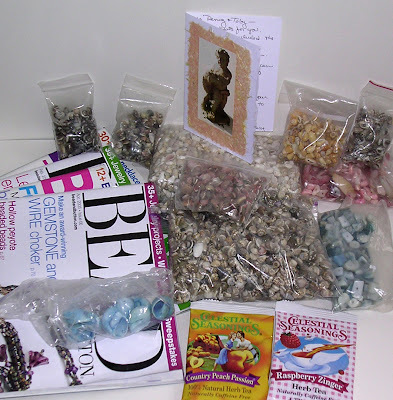 It is the most wonderful, generous gift, and totally unexpected, full of craft shells, bead magazines, chocolate (already eaten before the photo was taken!! 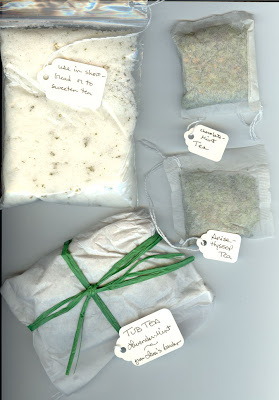 ), tea, and my favourite of all, Tara's handmade herbal teabags and bath bag. Does anyone recognise this? 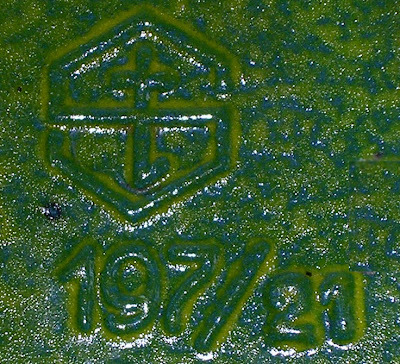 Toby bought it from an antique shop a couple of weeks ago, he thinks it might be West German, it is a planter style ceramic pot (20cm in length) and in the second image you can see the mark on the base. Anyone have any ideas? 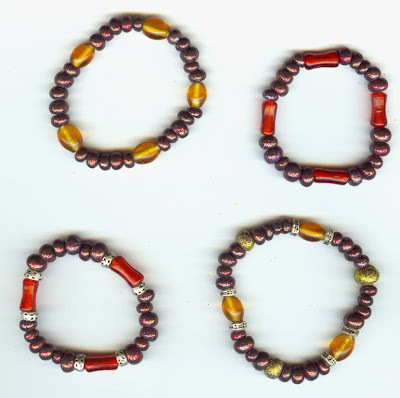 Please click on the images above to see them in more detail. 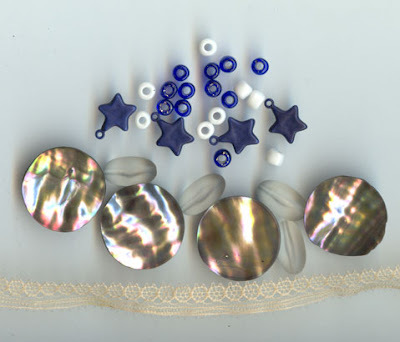 Toby has made these charms for bags and purses, or wherever you'd like to clip them! they are quite small, I have scanned them next to a ruler so you can see the size. Love heart, Fishy Bubbles, Honey Stone, and Black Rose. We have been very lucky recently. 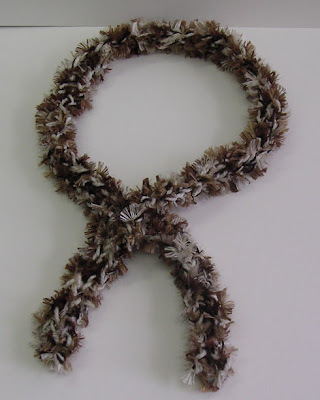 Toby has been extemely busy fingerknitting scarves. They are SO cute, each one is unique and they are all very narrow, here are a few that he has finished, and is hoping to sell! 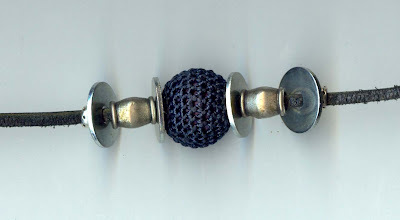 He is in the process of knitting more, and also awaiting jewellery supplies for his next project, handbag charms, so come back and visit us again soon to see more! 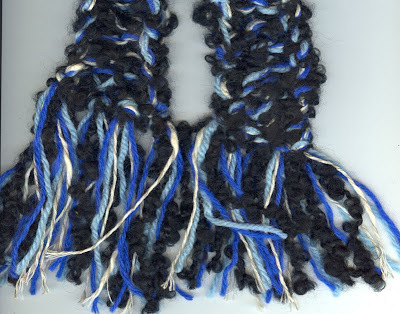 ICED SHEEP scarf is fingerknitted, with tassles, and is approx 53" long and 2" wide, if you click on the photograph it enlarges and you can see the wool and colours in more detail. 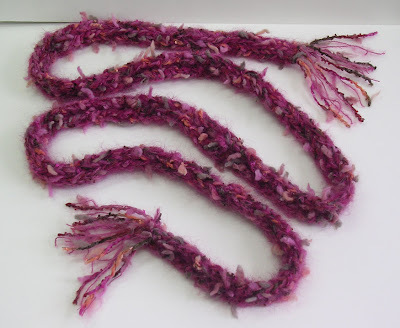 PINK FLUFF scarf has been fingerknitted by Toby, it is approx 78" long, with tassles at each end, and is about 2" wide. 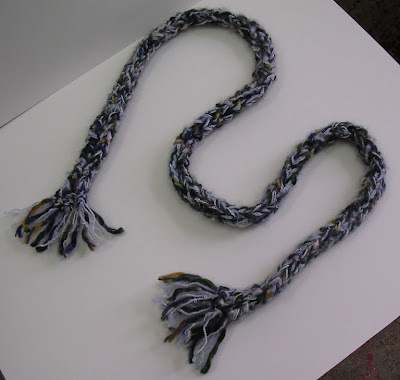 At woodcraft camp I learned how to finger-knit . 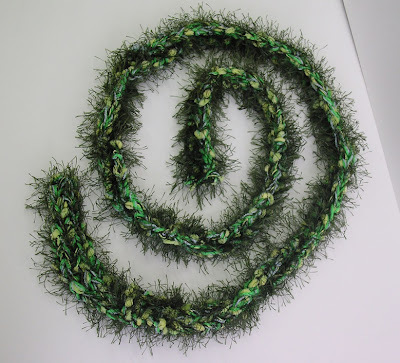 Here is a scarf i made for a friend. 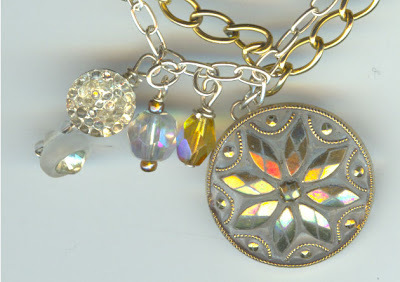 There will be more on the blog, for sale soon! 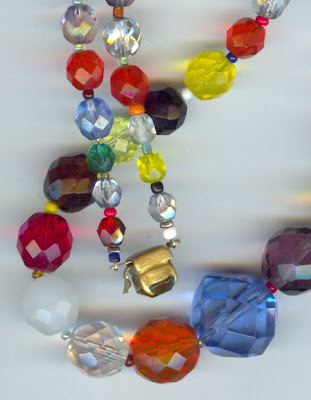 .....for all the WONDERFUL beads you sent me!